The allegations against State Sen. Leland Yee were outlined in an FBI affidavit in support of a criminal complaint. 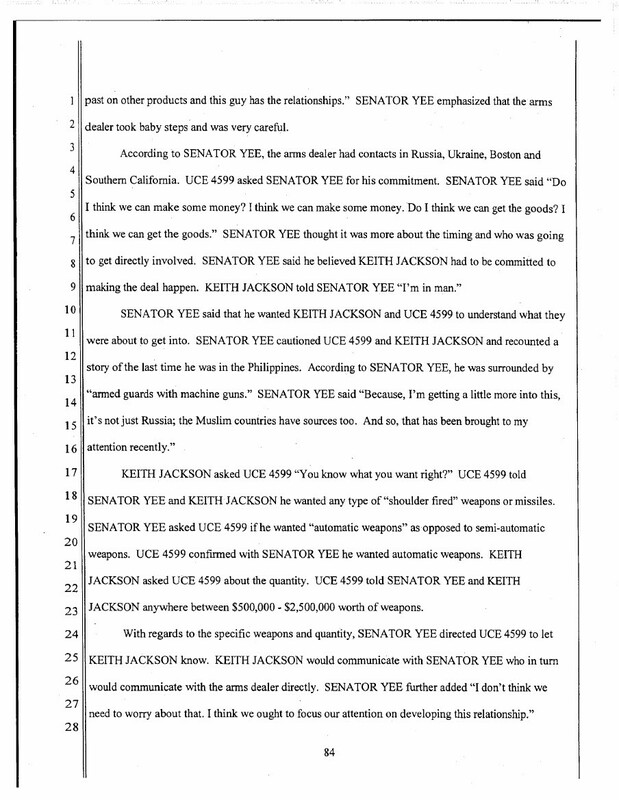 The affidavit accuses Yee of conspiracy to deal firearms without a license and to illegally import firearms. As we said earlier, we are strong proponents of presenting primary sources to our readers: here is a link to the arrest affidavit that the San Francisco Gate is hosting. Along with Wire Fraud charges Leland Yee is being charged with violations of Title 18, United States Code, Section 371, 922(a)(1) and 922(l) (Conspiracy to Deal Firearms Without a Licence and to Illegally Import Firearms). A discussion of the evidence related to this begins on page 83. Page 84 has a passage where Lee is stated to have asked the undercover agent whether he wanted automatic weapons as opposed to semi-automatic firearms. Here is an except from the arrest affidavit detailing that passage. We will continue to bring you more updates as they are released.